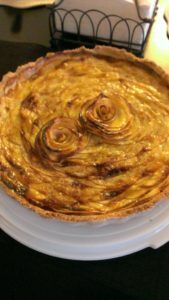 I found this apple tart (Tarte aux Pommes) in my archives and figured I would post the picture as a space holder for other food reviews. Imagine a buttery pastry crust, thinly mandolined apple slices layered upon a stewed apple base, glazed with apricot jam. It was so good and apple season is fast approaching – maybe I’ll make another?